I’ve known for awhile that Facebook and I needed to reevaluate our relationship. It was making me irritable, begging me to compare myself to others, and stealing valuable time (if even just ten minutes in a day). When I read that motivational writer Crystal Paine from moneysavingmom.com had deleted her personal account to make more time for her “best stuff,” I seriously considered it too. But after evaluating my own situation, I decided on a better solution that will help me engage with my own “best stuff”: family and writing. In order to stay active on both fronts, I’ve decided to keep my personal page, and I’ve also decided to start a “professional” writing page (using that term very loosely!). My professional page, on the other hand, will serve a different purpose, and a different audience. It will be a better place to put my longish, thoughtful, and/or devotional posts, which never get near the traffic that a picture of baby Sam does on my personal site (hey, I get it!). It will be another good way to speak to an audience that may not have a personal stake in my life, but that wants to read what I have to write, and that takes an interest in my writing journey. I anticipate spending much more time on the “professional” page, because “writing true stories for his glory,” “blogging lessons of daily life,” and talking with others about my passion (writing) is what energizes me and feeds my soul. And I think that, ultimately, this type of post is what feeds others’ souls too, more than a selfie, a picture of my lunch, or even the cutest picture of Sam. Not to say these are bad…just…I want to practice moderation, and keep first things first! May God help us all to use Facebook to its fullest…whatever that means for you! Of course, I hope that means “liking” my new Facebook fan page! If you do, I promise I will try not to post time-wasting stuff, but only that which is helpful for the Christian walk and the writer’s life. Thanks in advance for the “like”! Previously I published three resolutions for 2015, but they were vague and hard to measure (except the one about getting pregnant), so today I delineate SMART goals for my resolutions: Specific, Measurable, Attainable, Realistic, and Time-Bound. In other words, I am breaking my goals into small chunks so I will be more likely to attain them. 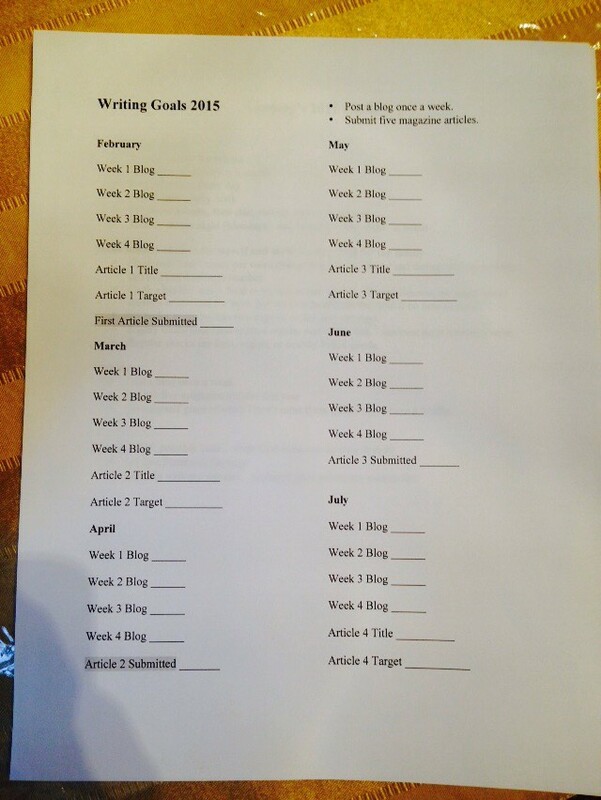 I have also typed out these goals in measurable formats and have posted them where I will see them every day. Resolution 1: Focus on my Family. This list of “family stuff” hangs on my fridge. The list of weeks is where I will write in the weekly song I will sing with Sam. 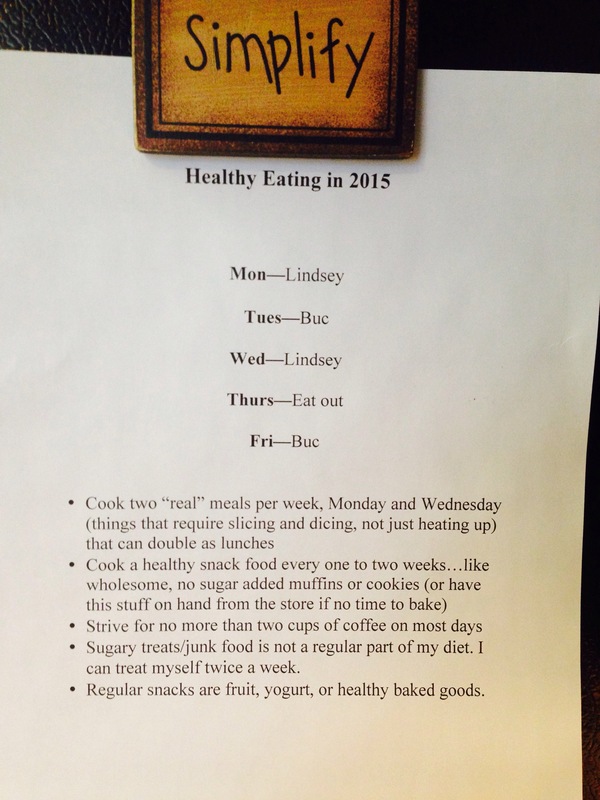 Resolution 2: Make healthy choices for myself and make healthy food for my family. I got Buc’s input on our family meal schedule, because he is not, shall we say, as experimental of an eater as I am! He generously agreed to take on the cooking for two nights a week–a relief for both him and me, because I can use those afternoons for other things, and he can count on two meals he is sure to like per week. He also agreed to take the family out to eat once a week to give us both a break in the cooking and evening cleanup departments. I sure have a good hubby! Resolution 3: Get pregnant in 2015 with my second, and final, child. I’m leaving this one to nature. I’ve added “writing” as an area I want to focus on this year, even though I intend it to take a backseat to family life. Below are some goals that seem realistic for me this year; but because I can get obsessive in the area of writing, I’ve listed the third goal to give myself grace if I don’t meet my first two goals. Give myself grace if/when I don’t meet these guidelines. I have a toddler. In case you’re curious, I’m getting a lot of my ideas and inspiration (such as the SMART acronym) from Crystal Paine’s Say Goodbye to Survival Mode. (And I got the book recommendation from hearing Crystal interviewed on Family Life Today–which radio program I also highly recommend). If you’re interested in getting help with setting and following through with goals, check out her book, or her very popular blog, moneysavingmom.com. In her book, she walks readers through setting up goals, a daily schedule, and more, all with the hope that the reader will Stress Less, Sleep More, and Restore [their] Passion for Life. Just be warned: Crystal is a highly driven woman with many, many goals, some Herculean (at least from where I sit in life right now), so I am trying to take her advice to not to compare myself with her, and to set my goals in the context of my individual circumstances. I realize my goals may change as I go along, should my circumstances change or should I discover a better fit for my life, but for now I am committed to implementing the suggestions she’s given, and doing what I’ve identified as most important to my values at this time. Stay tuned to see how it all goes! We can journey toward our goals together.